A new protocol developed for ultra-low dose CT scanning of orthopedic fractures by a multidisciplinary team of radiologists and orthopedic surgeons from NYC Langone Medical Center was announced at the annual meeting of the American Academy of Orthopedic Surgeons held March 1-5 in Orlando. Using a radiation dose 14-fold less than a standard CT, it produces diagnostic quality images offering more detail than a comparable radiograph. This development is not expected to impact the ordering of x-ray exams for patients with suspected or obvious fractures. However, when a fracture is identified near a joint, and particularly if a fracture involves the surface of a joint, a supplemental CT scan may be ordered. In addition to providing a greater level of detail, CT scans also help clinicians assess joint displacement and aid in surgical planning. 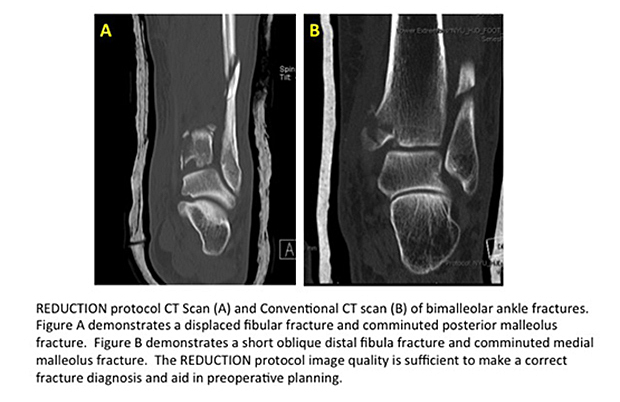 Sanjit R. Konda, MD, assistant professor of orthopaedic surgery at NYU Langone, worked with assistant professor of radiology Soterios Gyftopoulos, MD, a musculoskeletal radiologist, and colleagues, to develop the REDUCTION (Reduced Effective Dose Using Computed Tomography in Orthopaedic Injury) protocol. They initially applied the protocol to examine air around a knee joint where infections could easily develop. 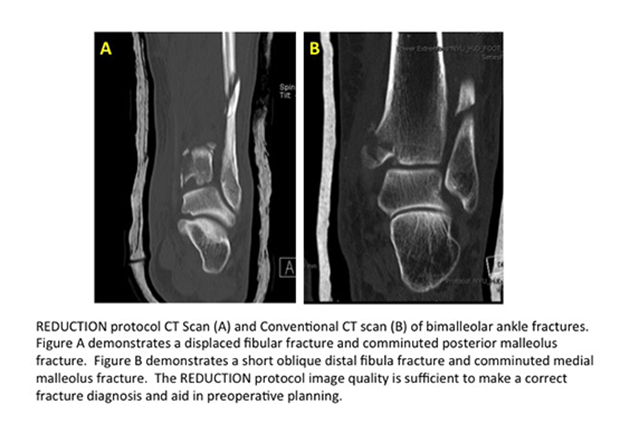 The application was so successful that the researchers decided to use the protocol to reduce radiation exposure when imaging traumatic joint fractures. The primary usage for the low dose CT is to rule out arthrotomy, pediatric plafond fractures (triplane), pilon fractures, tibial plateau fractures, intra-articular distal femur fractures, proximal humerus fractures, and distal radius fractures. The authors said that any image with intra-articular fractures visible on a radiograph would warrant a CT scan to further evaluate for the amount of articular depression and displacement. This would help aid in preoperative planning. Between August 2014 and March 2015, 50 consecutive patients with clinical symptoms of joint fractures had the ultra-low dose CT scan. For their study, images acquired from these scans were compared to standard-protocol two-dimensional CT images and 3D reconstructions of a sample of age-matched patients with similar fracture injuries. Both sets of images were anonymized and evaluated by 10 orthopedic fracture surgeons for diagnosis, management, and image quality. The total radiation dose for each imaging type was also recorded. The mean effective dose using the REDUCTION protocol was 0.03 mSv compared to 0.43 mSv for a standard CT. With the exception of two occult fractures, readers of the ultra-low dose CT images had a 98% sensitivity and an 89% specificity. They scored the same sensitivity with the conventional CT images, but only an 85% specificity. 3D reconstructed images for each group were equivalent in quality and diagnostic information they provided. Dr. Konda and colleagues have been following the clinical outcomes of the 50 patients, with the hope of expanding the protocol to other imaging applications. The authors told Applied Radiology that there may be potential in other clinical indications that depend on CT for preoperative planning as well as diagnosis. These clinical indications could include bone tumor cases, all pediatric cases, shoulder instability cases, and preoperative planning for shoulder replacements. AAOS 2016: Ultra-low dose CT scans successfully detect fractures. Appl Radiol.